Websites often present language selection to users with flag icons, but I think this is simply wrong. Flags represent countries. Adapt the content to his country: even if the language is correct, an English speaking visitor may be interested in British content rather than US content. If you have country specific content, let the user select his country first. Flags are perfectly correct in this case. If the country has been selected or if the content doesn't depend on the country, let the user select his preferred language. And back to my question here: how to graphically represent a language? I've seen "English" flags half US/half UK, but how would an Australian identify to that? My question is not about the techniques used to recognize a user's culture or country of origin using his IP and browser preferences, but how to avoid displaying available languages by their names? Do not use a flag to represent a language. There is no natural graphical representation for a language. The only acceptable icon for a language is its two letter code as it is used in the Windows standard language toolbar. Even with this icon, it is highly recommended to put the language name in plain text, preferably in its native form. Perhaps just the opposite of what you wanted but we have in a few cases of municipalities with diverse ethnicities resorted to displaying the top languages by name and adding a globe icon for other translations. You could also try making icons with abbreviations of the language name next the actual name. There is no good graphical language representation. Flags work in some situations, when there are limited choices (up to 4-5 flags) and no ambiguities. They fail for multilingual countries (e.g. India, China), and can look jarring for multi-country languages (e.g. English, Spanish). ISO 2-letter codes are often confusing and unfamiliar. For instance, BS is Bosnian (BA is country code and TLD), MS is Malay (MY is Malaysian TLD... but MY is Burmese language). Not confusing language with country. However, it does allow distinctive country-specific services when necessary (note Brasil and Portugues). Sorting the languages by their English name. Easy to find in a long list. Easy to search for using Ctrl+F on a busy page. Politically neutral (avoids questions like "why is Urdu below Tamil?"). Familiar to non-speakers (e.g. if you want to print an article in a language you don't know). Shows the native-language name, for those not familiar with English. The obvious disadvantage is that it takes up a fair amount of space. Unrelated tip: put the language choice on every page, linking to the the copy of that page in the relevant language. Many sites take the user back to the home page in the given language -- easier to implement, but almost never what the user wants. If you click on the More languages link, the BBC presents a page that not only shows more languages, but also maps country names to a map – and vice versa. Why this color? : It is similar to the color of tongue. It is pastel and not disturbing (indeed color options are available but this is our choice). Why this glyph? : Because it is not related to any other idea or symbol, it does not signify something else, it is exlusive for selecting language. Why the shape? : It is easy to draw, learn, recognise and remember. It works both black and white, very scaleable, simply put it has all the aspects of a working logo. I don't believe this has actually been taken up by any major sites as yet, and my opinion is that it looks more like a SAVE icon (3.25 floppy disk) than a tongue. However, is this something you would go with? Sorting through a large list of flags has never been helpful to identify your content. Having to identify your specific requirements amidst such a huge plethora of graphics is cute for designers, but unhelpful to users, who, unless they are familiar with the particular icon set and/or every country flag, will have a hard time visually processing and sorting. In comparison, most people with access to a web-navigating device are familiar with the Latin alphabet and which of its letters their country and language begins with (when romanized form when necessary). In seeking to represent languages pictorially, you would be creating a new visual taxonomy from scratch. Massive exacerbation. My advice is to include a single visual device (say a globe or blank flag) to prepend the label for quick recognition of the functionality, and a pure-text alphabetized list by drop-down for input. 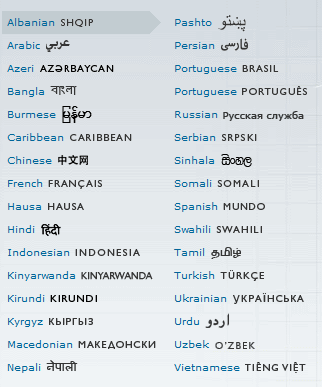 People can then use the universal functions of the Latin alphabet, direct text input, scrolling and arrow buttons to quickly select their desired option without first having to decode a new interface (when the whole purpose of multi-language or -country selection should be to minimize the user's need to assimilate new taxonomies). I suggest using icons with an abbreviation of the language on them. There are two major standards for language name abbreviation. One is ISO 639, which allows abbreviation languages into two or three letter abbreviation. Second one is IETF(I can't post more than one link so use wikipedia), which is more advanced and allows you to abbreviate both a language and a country. You can combine the selection of country and the selection of flag, by displaying the abbreviation with the flag as the background. Anyway, do not forget to add tool-tips with full language names. I agree with the initial suggestion, namely: flags should not be used to represent languages. For some web site visitors, a particular flag might be a natural representation of their language, and such a visitor if asked this question might mistakenly think people are being either politically correct or excessively analytical. My business relies on people making a purchase on the web sites I'm involved with. It's crucial they get the right impression within the first few seconds. This involves an emotional response as much as a logical one. If I want to pay my mortgage this month and next, do I want to start by confusing, insulting and frustrating the customers? You bet I don't. So what is the best solution? I suspect that languages don't generally have better graphical representations than simply the name of that language written naturally. As a footnote, we should acknowledge that we're talking mainly about written languages in this Q&A, which is what counts for most web pages (which are typographical). There are a number of spoken Chinese languages, but for a web page it's likely the distinction between scripts. The Apple way is to do the Country first and then the Country Name in the language - so reverse the standard locale from en_GB to GB en. I think it makes sense that some one Suisse will search for their Country first and then the language. So Swiss German is | and Belgian Dutch is | . I think this would work for most European and South American languages, but I don't know how it would work for Asian languages. You could focus on the symbols that are used to change language with in country websites. Also, maybe step back and consider the entry and exit points to the language choice. Are users searching, navigating by links? In some sites above you can see how enabling users to get to their country option and then choose a language is priovided, in others I have seen, where entry locales cannot be detected by browser etc, providing a long list of country/language (or locale) options in the native language preferably. If I look at other products (not on the internet) that contain language-specific information, for example user manuals and product packages listing the ingredients and such, recurring ways of doing that usually are oval-shaped language codes (which might still be country codes), small flags, or the full language name. As a user, I find flags work best when it comes to indicating the place of language choice: when I see a flag, whichever country it is from, it clearly states that that's where you can change the language. I would suggest putting the language choice in the upper right corner or on the bottom of the left menu column - those are the places that are most commonly used and therefor easiest to find. As for the sorting of longer lists (and especially sorting on English names), I'd suggest you actually try to find out what the users find easiest. Sorting a list on English names makes it very difficult to find a language that doesn't start with the same letter. (I can either interpret English, or look at the different fonts, but not both. This has been shown also with display of a word saying 'red' in a blue color. People can observe one easily, the other one with a little more difficulty, but both at the same time is really really difficult.) My suspection is that the list given as an example, although very clear and goodlooking, might not be actually be the easiest in use. Drop down menu with language choice, what should the languages language be? Drop down list, radio buttons or something else for a language selector (of two languages)? Are there any other approaches to language selection other than these? How to represent site language and article language without confusing the user? What would be an appropriate visualization for the arabic language?